NKG2D recognizes multiple diverse ligands. Despite recent efforts in determining the crystal structures of NKG2D-ligand complexes, the principle governing this receptor-ligand recognition and hence the criteria for identifying unknown ligands of NKG2D remain central issues to be resolved. Here we compared the molecular recognition between NKG2D and three of the known ligands, UL16 binding protein (ULBP), MHC class I-like molecule, and retinoic acid early inducible gene as observed in the ligand-complexed crystal structures. The comparison shows that while the receptor uses a common interface region to bind the three diverse ligands, each ligand forms a distinct, but overlapping, set of hydrogen bonds, hydrophobic interactions, and salt bridges, illustrating the underlying principle of NKG2D-ligand recognition being the conservation in overall shape complementarity and binding energy while permitting variation in ligand sequence through induced fit recognition. To further test this hypothesis and to distinguish between diverse recognition and promiscuous ligand binding, four ULBP3 interface mutations, H21A, E76A, R82M, and D169A, were generated to each disrupt a single hydrogen bond or salt bridge. All mutant ULBP3 displayed reduced receptor binding, suggesting a specific, rather than promiscuous, receptor-ligand recognition. Mutants with severe loss of binding affect the receptor interactions that are mostly buried. Finally, a receptor-ligand recognition algorithm was developed to assist the identification of diverse NKG2D ligands based on evaluating the potential hydrogen bonds, hydrophobic interactions, and salt bridges at the receptor-ligand interface. The cytolytic activity of NK cells depends upon the balance between their surface-expressing activating and inhibitory receptors (1, 2, 3, 4, 5). While the inhibitory receptors, such as killer Ig receptor (KIR),3 Ig-like transcript (ILT), CD94/NKG2, and some Ly49 receptors, possess ITIM motifs in their cytoplasmic tail, the activating NK receptors carry a transmembrane charge to couple with either ITAM-containing FcRγ, CD3ξ, and DNAx activation protein (DAP)12 or ITAM-less DAP10 adaptor molecules. In human, examples of known activating NK receptors include NKR-P1, CD16, 2B4, NKG2D, NKp46, NKp30, and NKp44. In mice, certain Ly49 receptors, such as Ly49D and Ly49H, are also part of the activating NK receptors. To date, the ligands for many inhibitory receptors have been identified as self-class I MHC molecules. Crystal structures of three inhibitory receptor-ligand complexes, the KIR2DL2/HLA-Cw3 and KIR2DL1/HLA-Cw4 in humans and the Ly49A/H-2Dd in mice (6, 7, 8), revealed molecular recognition between the inhibitory receptors and their cognate class I MHC ligands. In contrast, the ligands for many activating receptors, with exception of 2B4, NKG2D, and Ly49H, remain to be identified. The ligands for NKG2D, an activating receptor that signals through DAP10 and phosphoinositol 3-kinase, have been identified as class I MHC-like families of MIC and ULBP proteins in humans and as H60 and retinoic acid early inducible gene (Rae1) proteins in mice (9, 10, 11, 12). The expression of these genes has been shown on the surface of certain tumor cells or to be stress induced. Unlike the inhibitory KIR that recognize a set of conserved residues in the polymorphic region of classical MHC molecules and are capable of distinguishing class I MHC ligands based on single amino acid changes (6, 13, 14), NKG2D recognizes diverse ligands with not only limited sequence homology (25–40% sequence identities between the families), but also different domain organizations. For example, while all NKG2D ligands possess the homologous class I MHC-like α1 and α2 domains, MIC genes contain additional α3 and transmembrane domains, whereas ULBP, Rae1, and H60 families are glycosylphophatidylinositol anchored. To understand the principle of NKG2D ligand recognition, the crystal structures of a murine ligand-free NKG2D and its complex with Rae1β (15, 16), the human NKG2D/MHC class I-like molecule (MICA) and NKG2D/ULBP3 complexes (17, 18), have been determined. The results show that while the overall docking between NKG2D and the ligands is similar, the detailed receptor-ligand interfaces vary considerably among the MICA, ULBP3 and Rae1β complexed structures. First, aside from a small number of conserved hydrogen bonds and salt bridges, more than half the ligand interface residues vary either in their amino acid identities or in their location. Second, despite a common set of NKG2D residues found in the interface of all three ligand complexes, a number of these interface residues adopt distinct side chain conformations and interact with different ligand residues in different complexes. This led to an induced fit hypothesis for NKG2D-ligand recognition, in which the local conformation of the receptor is dictated in part by the constitution of its ligand interface residues (18). The plastic nature of the NKG2D-ligand interface is consistent with the ability of the receptor to recognize diverse ligands. The basis for this interface plasticity, the principle of NKG2D recognition, however, is still unclear. Through structural comparison between the receptor-ligand complexes and through mutational studies that affect NKG2D/ULBP3 binding, we attempted to address factors important for this receptor-ligand recognition. In doing so, we hoped not only to understand the underlying principle of NKG2D-ligand recognition, but more importantly to predict unknown ligands of the receptor. The cDNA encoding the extracellular region of ULBP3 was cloned into pET22b (Novagen, San Diego, CA) as previously described (18). For each mutant, the 5′ and 3′ overlapping fragments of ULBP3 were amplified from ULBP3-pET22b in separate PCRs. The forward primer for the 5′ fragments and the reverse primer for the 3′ fragments were identical for all mutants and contained an NdeI and an XhoI restriction site, respectively (Table I⇓). The reverse primer for the 5′ fragment and the forward primer for the 3′ fragment were complementary and included the nucleotide substitution generating the amino acid variation (Table I⇓). Amplified 5′ and 3′ fragment pairs of each mutant were purified by agarose gel electrophoresis, mixed, and reamplified using the common forward and reverse primers. Amplified fragments were purified by agarose gel electrophoresis, digested with NdeI and XhoI, and cloned into the corresponding sites of pET22b. Incorporation of the appropriate nucleotide substitution in each ULBP3 mutant was confirmed by DNA sequencing. The mutants of ULBP3 (residues 1–200) were expressed as Escherichia coli inclusion bodies and then reconstituted in vitro. In brief, cells containing ULBP3-expressing plasmid were grown in a 10 L Bioflo 3000 bioreactor vessel (New Brunswick Scientific, Edison, NJ) and induced with 0.5 mM isopropyl-β-d-thiogalactopyranoside at an approximate OD596 of 1.7 for 4 h. The inclusion bodies were isolated by washing repeatedly with a 2 M urea solution and then were dissolved in 6 N guanidine hydrochloride before refolding. The refolding buffer consisted of 0.5 M l-arginine, 2.5 mM cystamine (or oxidized glutathione), 5 mM cysteamine (or reduced glutathione), 10 μg/ml AEBSF, and 100 mM Tris (pH 8.0). The renatured ULBP3 was concentrated on a nickel affinity column (Qiagen, Chatsworth, CA) and was further purified on a Superdex 200 size exclusion column (Amersham Pharmacia Biotech, Piscataway, NJ). All mutations were confirmed by electrospray ionization mass spectrometry. Surface plasmon resonance measurements were performed using BIAcore 3000 instrument (BIAcore, Piscataway, NJ). The receptor, NKG2D, was immobilized at a concentration of 1 μM in 10 mM sodium acetate, pH 5.2, on a CM5 sensor chip using N-hydrosuccinimide/1-ethyl-3(-3-dimethylaminopropyl)-carbodiimide hydrochloride at a flow rate of 20 μl/min. Flow cell 1 was mocked with N-hydrosuccinimide/1-ethyl-3(-3-dimethylaminopropyl)-carbodiimide hydrochloride. The binding buffer consisted of 20 mM NaCl, 3 mM EDTA, 0.005% surfactant P20, and 10 mM HEPES, pH 7.4, mixed with various concentrations of analyte. Binding of the wild-type and mutant ULBP3 proteins to immobilized NKG2D was measured using serial dilutions of the analyte from 30 to 0.059 μM at a flow rate of 20 μl/min. All Kd were obtained either from a linear regression of steady state 1/response vs 1/C plots using ORIGIN 3.0 (OriginLab, Northampton, MA) or from kinetic rate constants fitted with the BIAevaluation software package (BIAcore). NKG2D displays significant conservation at both the amino acid sequence and the three-dimensional structural level. The overall sequence identity of the receptor is ∼60% between human and mouse. At the structural level, the superposition between the human and murine NKG2D results in a root-mean-square (r.m.s.) deviation of 0.95 Å among 233 Cα atoms. In contrast, the amino acid sequences of NKG2D ligands share <40% identity between the human ULBP and mouse Rae1 genes (Table II⇓). The divergence in amino acid sequence is also reflected at the level of three-dimensional structures (Table II⇓). The superposition of the α1 and α2 domains between the human and mouse ligands resulted in an r.m.s. deviation of 2.3 Å, considerably worse than the structural agreement between the human and mouse NKG2D. Interface complementarity between two interacting protein surfaces is often measured by a shape complementarity index, Sc, which calculates the surface topology of two interacting proteins and measures the degree of complementarity in their interacting surfaces by a curvature analysis. Sc values range from 0–1, with 0 being noncomplementary and 1 being a complete surface match (21). The Sc values for highly complementary interfaces, such as those between proteases and protease inhibitors and between Abs and Ags, are in the range of 0.65–0.75 (21). The less complementary interfaces, such as those between TCRs and their class I MHC ligands, have Sc values between 0.45 and 0.6 (22). The calculated Sc values for the three NKG2D complexed structures are 0.72, 0.65, and 0.63, for the MICA, ULBP3 and Rae1β complexes respectively (16, 17, 18). These values are also greater than those between KIR and HLA (Sc = 0.58) (6) and between CD2 and CD58 (Sc = 0.58) (23), indicating a good shape complementarity in NKG2D-ligand recognition. Despite the diverse ligand sequences, all three NKG2D-ligand complex structures display similar overall receptor-ligand binding (Fig. 1⇓). In particular, the receptor in all three complexes uses a common set of residues to interface with the ligand residues in common structural regions. This conservation in receptor binding mode among the diverse ligands suggests the importance of shape complementarity in NKG2D-ligand recognition. The question of what mechanism NKG2D receptor employs to recognize very diverse ligands can be addressed by a detailed structural comparison of binding modes in three different NKG2D receptor-ligand complexes known to date. First, there are no large conformational changes in either the receptor or the ligands upon complex formation. This is evident from an r.m.s. deviation of 0.48 Å (among 246 Cα atoms) between the structure of a murine ligand-free and that of the Rae1β-bound NKG2D, and the r.m.s. differences of 0.92 Å (for 147 Cα pairs) and 0.57 Å (for 147 Cα pairs) between the structures of receptor-free and receptor-bound ligands for MICA and Rae1β, respectively. Second, variations in docking orientation are observed in each structure to compensate for individual ligand surfaces. When the three complex structures are superimposed using only their NKG2D subunits, the three ligand orientations vary slightly from each other by ∼6° (rotation required to superimpose the ligands) between ULBP3 and MICA, 10° between ULBP3 and Rae1β, and 10° between MICA and Rae1β. Thus, it appears that NKG2D accommodates diverse ligand surfaces through adjustments in their docking orientations. Third, variations in loop and side chain conformations are observed in both the receptor and the ligands to reflect their diverse interfaces. On the receptor side, the conformation of the L2 loop, residues 181–185 on both subunits of the receptor dimer, varies ∼4–5 Å in position among the three complexes (Fig. 2⇓). There are ∼23 NKG2D residues, half from each subunit, at the ligand interface area. Most of them are identical between human and mouse. They form a total of 19 hydrogen bonds, five salt bridges, and two hydrophobic clusters (Table III⇓). Among them, only two hydrogen bonds (1) from aspartate or glutamate of a ligand to Tyr199 of the receptor and 2) from arginine of a ligand to Tyr152 of the receptor) and one salt bridge between aspartic or glutamic acid of a ligand and Lys197 of the receptor are conserved in all three structures. While different ligands form different hydrogen bonds with NKG2D, about half of the hydrogen bonds are common between any two of the ligands. For example, four hydrogen bonding NKG2D residues Ser195, Tyr199, Tyr152, and Glu183 are common between the ULBP3 and MICA complexes. Similarly, a subset of distinct, but overlapping, NKG2D residues participates in hydrophobic interactions with each of the ligands. Structural comparison of NKG2D secondary structure elements involved in the ligand binding. Loops L1 and L2 and the β6 strand are shown as a thick colored lines. Secondary structure elements of NKG2D from its complex with ULBP3 are colored red, those from MICA complex are beige, and those from Rae1β complex are green, respectively. The overall trace of NKG2D is given as a thin gray line for reference. On the ligand side, alternative side chain pairing and conformations are also observed for the interface residues (18). 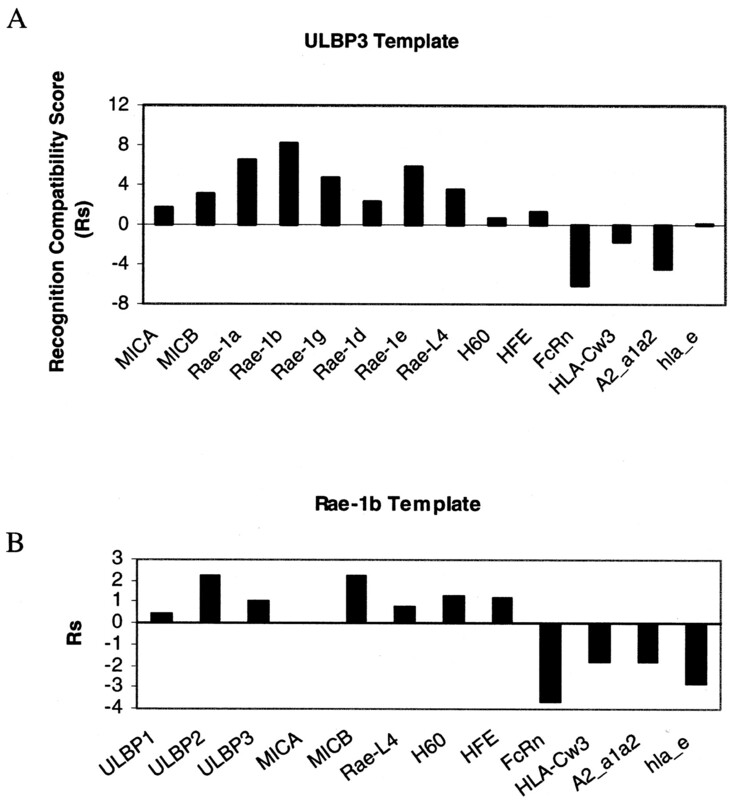 MICA, ULBP3, and Rae1β each contribute 25, 19, and 17 residues, respectively, to the receptor interface. Among them, eight residues share common sequence positions, and only two residues, Arg82 and Asp169 (ULBP3 numbering), are conserved. However, conformational and sequence variations are also observed even for these relatively conserved residues. For example, Asp169, conserved between MICA and ULBP3, but replaced by Glu in Rae1β, forms a hydrogen bond with Tyr199 of NKG2D in all three structures (Fig. 3⇓, A and B). It also forms a salt bridge with Lys197 of NKG2D in ULBP3 and Rae1β complexes, but in the MICA complex, Lys197 forms a salt bridge with a different aspartate residue, Asp65. The other conserved residue, Arg82 of ULBP3, forms a hydrogen bond with Tyr152 of NKG2D. This Arg-Tyr pair has a similar side conformation in both the ULBP3 and MICA complexes, except the arginine of MICA makes an additional salt bridge with Glu201 of the receptor (Fig. 3⇓D). The same Arg-Tyr pair, however, interacts differently in the Rae1β complex, in which Tyr152 adopts an alternative side chain conformation and the arginine is located ∼5 Å away from Arg82 of ULBP3 (Fig. 3⇓C). Aside from the conserved residues, each ligand appears to form a set of distinct, but overlapping, hydrogen bonds with NKG2D (Fig. 4⇓ and Table III⇑). The numbers of hydrogen bonds formed between the receptor and MICA, ULBP3, and Rae1β are 13, nine, and seven, respectively. Similarly, all three ligands appear to form hydrophobic interactions with both clusters A and B of NKG2D, although the shape of each hydrophobic patch varies among the ligands (Fig. 4⇓ and Table III⇑). Surface representation of NKG2D ligands. Hydrophobic residues involved in interactions with the receptor are shown in yellow; positive and negative charges are painted blue and red, respectively. In this view of ligands, the groove between the α1 and α2 helixes is oriented horizontally across the page. Thus, despite the lack of sequence conservation, the ligands of NKG2D appear to have satisfied the receptor interface energetic requirement by forming hydrogen bonds, salt bridges, and hydrophobic interactions using different interface residues. In general, sequence conservation in ligands ensures the preservation of both the free energy of binding at a receptor-ligand interface and the exact local interface residue pairing and hence their conformations between the receptor and its ligand. However, when ligand sequences are not conserved, the preservation of precise local interface receptor-ligand residue pairing becomes difficult. Nevertheless, diverse ligands can still preserve the free energy of binding by making sufficient receptor interface interactions with alternative ligand residues. The receptor in this case is likely to adopt ligand-induced local conformation to best fit the surface of individual ligands. Four ULBP3 mutations, H21A, E76A, R82M, and D169A, were created in the receptor interface region (Table III⇑), verified both by DNA sequencing of the constructs and by mass spectrometry of the purified inclusion bodies. The refolded mutant proteins display similar m.w. as the wild-type by SDS-PAGE, suggesting that no proteolytic degradation occurred in refolding of the mutants. All four mutants migrate as monomers similar to the wild-type protein by size exclusion chromatography, indicating no folding defects as the result of mutations (Fig. 5⇓). The binding of the wild-type ULBP3 to NKG2D has a Kd of 4 μM, as measured by BIAcore. The Kd values for ULBP3 mutants are 30, 105, 233, and 77 μM for H21A, E76A, R82M, and D169A, respectively. All mutations resulted in reduced receptor binding affinities compared with the wild type. His21, which forms a hydrogen bond with the carbonyl oxygen of Glu183 of NKG2D, and Glu76, which forms a salt bridge with Lys150 of NKG2D, are not well conserved among the NKG2D ligand sequences. 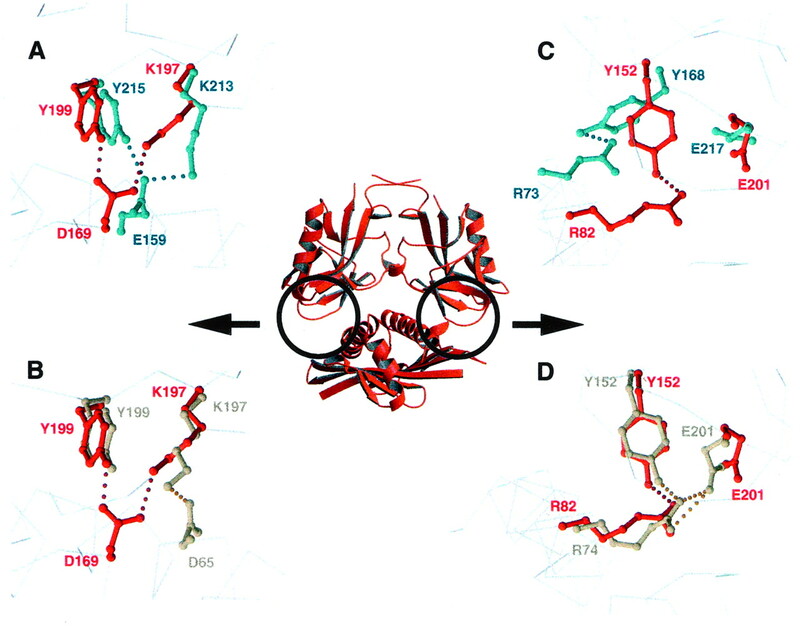 The ∼8- and 20-fold reductions in the receptor binding of H21A and E76A mutants indicates that the nonconserved interface hydrogen bond and salt bridge contribute energetically to the receptor recognition. This is consistent with the idea that the ligands of NKG2D need not be conserved in sequence providing they satisfy the receptor interface binding energy requirement. In fact, the mutational loss in binding at Glu76 is no less than that at Asp169, which is quite conserved among the NKG2D ligand sequences. Unexpectedly, R82M is the most destabilizing interface mutation among the four mutations, with ∼50-fold reduction in NKG2D binding affinity. This reduction in binding can be attributed largely to the loss of a hydrogen bond between Arg82 of ULBP3 and Tyr152 of NKG2D, and the loss of favorable electrostatic interaction between the Arg and Glu201 of NKG2D, since the Met replacement presumably preserves the hydrophobic interface of the wild-type Arg82. It is worth emphasizing that Arg82 is the most conserved residue among the ligands. It is also nearly buried at the receptor interface (Fig. 6⇓B). Furthermore, the NKG2D residue that pairs with Arg82, namely, Tyr152, is among the most buried receptor residues at the interface (Fig. 6⇓A). The drastic reduction in the binding of R82M underscores the importance of the conservation of this residue. Gel filtration elution profile and SDS-PAGE of ULBP3 mutants. The gel filtration experiments were conducted on an Amersham Bioscience HR10/30 Superdex 200 column. All samples ran at an apparent Mr of 26 kDa. The sample lanes marked 1–5 are refolded proteins of E76A, H21A, R82M, D169A, and the wild-type ULBP3, respectively. Lane 6, Molecular mass standard (labeled in kilodaltons). Plots of the solvent accessible surface area buried upon binding of NKG2D to ULBP3. Solvent accessible surface area values were calculated using the SURFACE program from the CCP4 suite. For each residue, the accessible surface area in the bound state (SAbound) was calculated from the complex crystal structure PDB coordinates (1KCG.pdb). To calculate the accessible surface area for the receptor in the free state (SAfree), the PDB coordinates for the ligand were deleted from the complex structure PDB file, and vice versa. The surface area buried was then defined as (SAfree − SAbound). Important interface residues are labeled. Two α helixes of ULBP3 are illustrated as cylinders and are α1 (65–87) and α3 (156–183). To date, the functions of several known inhibitory receptors have been characterized. They include members of KIR family that recognize human classical class I MHC molecules (14, 24, 25), members of the Ly49 family receptors that recognize murine class I MHC molecules (26, 27), the CD94/NKG2 receptors that recognize HLA-E in human and Qa-1 in mouse (28, 29, 30), and the ILT/LIR receptors that recognize the α3 domain of classical class I MHC (31). Compared with NKG2D, the ligand recognition by the inhibitory receptors is quite different. First, the ligands of inhibitory receptors display better structural and sequence conservation than the ligands of NKG2D. At the sequence level all classical class I MHC molecules share >80% sequence identity within species and ∼75% sequence identity between human and mouse. Even greater sequence homology is shared among the ligands of individual receptors, such as HLA-Cw allotypes, which are the ligands for KIR2D receptors, sharing >90% sequence identity. Moreover, the receptor-ligand specificities have been shown to be controlled by only a few residues at the ligand side. For example, two amino acids, residues 77 and 80 of the HLA-C heavy chain, are known to control the ligand specificity among the HLA-Cw allotypes for KIR2DL1 and KIR2DL2 receptors (14). Similarly, each inhibitory Ly49 receptor isoform, although often displaying overlapping MHC allelic specificity, generally recognizes a small number of class I MHC alleles (32, 33). The well-recognized sequence conservation among the inhibitory ligands contrasts sharply with the diverse ligands of NKG2D. This creates an interesting receptor-ligand dichotomy. On the one hand, there appear to be too many inhibitory receptors for a family of well-conserved MHC ligands. On the other hand, there are too many diverse ligands for just one NKG2D gene. The question is why the immune system employs multiple, but specific, inhibitory receptors and yet has only one NKG2D. Second the ligand binding affinities appear to be different between the inhibitory receptors and NKG2D. The affinities between several known inhibitory receptors and their ligands, including that between KIR2D receptors and class I HLA-Cw molecules (6, 34), between Ly49 and their class I MHC ligands, between CD94/NKG2 and HLA-E (35, 36), and between ILT-2 (LIR-1) and class I HLA molecules (37), all have been measured by solution binding experiments to have dissociation constant Kd of ∼10−5–10−6 M. This is somewhat lower than the reported Kd of 10−6–10−8 M between NKG2D and its ligands, MICA, H60, and Rae1 (17, 38, 39). 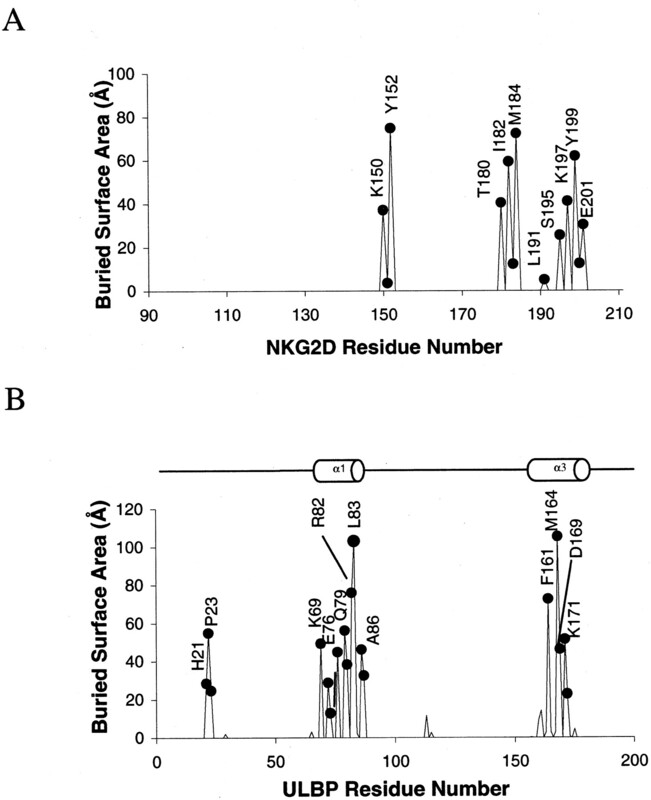 The higher affinity of NKG2D is also consistent with the observed larger buried interface area between NKG2D and its ligands (1900–2200 Å2) than between KIR and HLA-C’s (∼1600 Å2) (6, 7, 16, 17). The lower affinity of the inhibitory receptors suggests that their ligand binding is closer to the threshold of immune recognition and that they would tolerate less mutational disruptions than NKG2D. Earlier mutational work, in which a single charge to alanine mutations in the receptor resulted in complete loss in ligand recognition, suggested that KIR2DL2/HLA-Cw3 binding was sensitive to mutational changes. Our current results of ULBP3 mutants showed that different mutations resulted in varying degrees of loss in NKG2D binding depending on the site of mutation, suggesting that NKG2D is more tolerant to ligand mutations than KIR. Third, the structural mechanism of ligand recognition between NKG2D and the inhibitory receptors also appears different. While NKG2D displays significant interface plasticity through induced fit recognition, the conformation of inhibitory receptors, as shown in the comparison between KIR2DL2/HLA-Cw3 and KIR2DL1/HLA-Cw4 complex structures, remains much the same, indicating a mostly rigid body recognition used by the inhibitory receptors. Since all class I HLA structures differ by 0.6–1 Å in r.m.s. deviations, much smaller than the structural differences among the NKG2D ligands, an induced fit binding mechanism would cause each inhibitory receptor to recognize all class I MHC molecules as ligands. Likewise, if NKG2D adopted a rigid body ligand binding mechanism, it would not be able to recognize the diverse array of ligands. The characteristic rigid body ligand recognition is also consistent with the solution binding data showing very rapid on and off binding kinetics for KIR binding to HLA-C (34) as well as for CD94/NKG2A binding to HLA-E. The sequence, structural, and mutational data suggest that the immune system employs different ligand recognition mechanisms to best achieve its needs. In the case of inhibitory receptors, whose function is to detect danger through “missing self,” the ligand recognition is very specific, and each receptor is designed to monitor only a small number of conserved class I MHC molecules. In addition, their ligand binding appears to be less tolerant of mutations. The combination of high specificity with low affinity of binding recognition ensures maximum sensitivity in immune surveillance. An immune system is designed not just to recognize a global loss of class I expression as a result of catastrophic events, but also to recognize the disappearance of a few specific class I MHC alleles among otherwise abundant overall surface expression of class I MHC in the event of viral infections. The function of the activating NKG2D receptor is to detect danger through the appearance of stress- or transformation-induced ligands. The diversity in NKG2D ligands presumably reflects complex pathogenic conditions. The combination of a plastic interface with high ligand affinity in NKG2D-ligand recognition ensures maximum efficiency in capturing all possible ligands. Predicting ligands of NKG2D becomes a difficult task due to their lack of sequence and structural conservation. In an attempt to evaluate the unique attributes among these ligands, we have developed a receptor-ligand recognition compatibility score that evaluates potential ligands based on their abilities to form interface salt bridges, hydrogen bonds, and hydrophobic interactions, rather than sequence conservation. The algorithm calculates the solvent accessibility weighted energetic contribution for each interface residues in the structure of a receptor-ligand complex, applies the energy calculation to new sequences to which the structures are not known, and evaluates the compatibility based on a mutational matrix (http://red.niaid.nih.gov/programs.html). Using this algorithm, a set of sequences corresponding to both the ligands and nonligands of NKG2D were scored using both NKG2D/ULBP and NKG2D/Rae1β complex structures as templates (Fig. 7⇓). Overall, the NKG2D ligands scored higher than nonligands. In principle, this interface compatibility scoring algorithm should also work for nondiverse ligands in which sequence conservation alone is able to differentiate between the ligands and nonligands of a receptor. To test this, a set of classical class I MHC sequences was scored for their compatibility of being ligands of KIR2DL2. The results show that all ligands of KIR2DL2, including HLA-Cw1, -3, -7, and -8, have a score of 8.6, which is higher than the score of 5.6 for ligands of KIR2DL1. Interestingly, while most HLA-B alleles scored ∼3.0, HLA-B46, which is known to bind KIR2DL2 (40), scored 8.6, the same as other KIR2DL2 ligands. Recognition compatibility score. A, Sequences are scored based on the NKG2D/ULBP3 structural template and are shown as relative scores to HLA-E. B, Scores are calculated based on NKG2D/Rae1β template and are shown as relative scores to MICA. We thank C. Hammer for mass spectroscopy measurements, M. Garfield for N-terminal peptide sequencing, and R. Strong for providing the PDB coordinates of Rae1 and NKG2D/Rae1 complex before publication. ↵1 This work was supported by the intramural research funding from the National Institute of Allergy and Infectious Diseases, National Institutes of Health. ↵3 Abbreviations used in this paper: KIR, killer Ig receptor; ILT, Ig-like transcript; ITAM, immunotyrosine-containing activation motif; ITIM, immunotyrosine-containing inhibitory motif; MICA, MHC class I-like molecule; PDB, Protein Data Bank; Rae1, retinoic acid early inducible gene; r.m.s., root-mean-square; ULBP, UL16 binding protein; DAP, DNAx activation protein.